EzCab App PROMO CODE campaign will be launched as part of the company's effort to promote the use of EzCab e-hailing app. 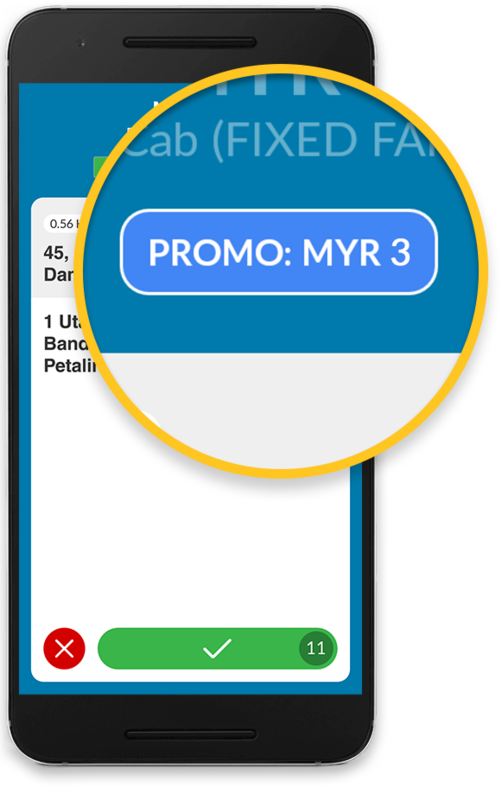 Incoming orders with Promo Code will be displayed in the BLUE box as per image shown. Kindly deduct the PROMO discount displayed from total fare. The Promo Code discounted amount will be converted into your EzWallet Balance & you may Cash Out the balance. Click HERE to learn how to Cash Out*. Note: * Minimum RM20 balance for Cash Out & RM5 for Top Up from EzWallet Balance to Credit Balance. Kindly deduct the PROMO discount displayed from total fare. The Promo Code discounted amount will be converted into EzWallet Balance. Promo Code value will be automatically converted to respective Driver’s EzWallet Balance. Only completed rides (upon drop-off) are considered valid. All bookings must be made via the EzCab App. Penalty will be imposed to driver who does not apply discount to Promo Code passengers.